The challenge of sitting on a horse in balance may appear no more complex than any other form of balancing - just a case of getting your bearings and learning to go with the horse. In fact, there is a lot more to it than that, because on a horse, our natural balancing reflexes do not lead us to sit in a way which will eventually allow a profound gymnastic connection with the horse - a way which is also comfortable for both horse and rider. Why Do We Not Find Good Balance Naturally When Sitting On A Horse? The first, and most obvious, is our impulse to hold on with our hands when we feel unstable. Unfortunately this is very undesirable when riding a horse, because the hands are responsible for holding the reins, which connect to the horse's sensitive mouth via the bit (or to the delicate nose bones if riding bitless). Holding onto the horse's mouth is not only uncomfortable for the horse, causing both mental and physical tension, but it also has the effect of blocking the horse's energy right though his body, as the pressure in the reins creates a barrier to the forward movement. It is also an ineffective way of finding true balance while sitting on a horse, because it takes the rider's focus of balance away from the connection of their body with that of the horse, through the seat, and puts it into a part of the horse's body which is highly flexible and not necessary stable. The reaction which takes us away from finding the correct position on a horse is our instinct to lean forwards when we feel the movement of the horse underneath us. This is probably because, when we feel the power of the horse coming through the horse's back from the haunches, our impulse is to disconnect ourselves from the movement by taking the weight out of the back of the seat-bones, so that we no longer feel the power coming through into our own body. It is also a natural human reflex to crouch into the fetal position in order to protect ourselves when we are under threat. When sitting on a horse, this defensive position equates to tipping the upper body forwards, so that the rider's shoulder are in front of their pelvis. 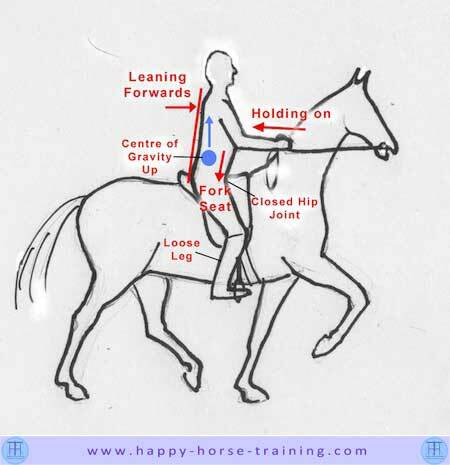 The problem with leaning forwards when sitting on a horse, is again that it makes us lose our connection with the horse's body, because we lift our weight out of the back of the seatbones - the place where we can best connect with the 'engine' of the horse's movement: the haunches. It is only when we become one with the horse's power that we can be in full security on a horse, and be in harmony with the movement. Leaning forwards, even slightly in front of the vertical, tilts the rider's pelvis onto the pubic bone, which is not the right orientation to be able to follow and engage with the movement. In this position, the seat-bones point backwards against the direction of the horse's energy, and the rider's lower back is hollow, exposing the vertebrae to compression, with the impact of the movement, and possible damage. The other reason leaning forwards does not help the balance of horse and rider is that the horse already carries around two-thirds of his weight on the forehand (front legs), which is fine for his natural balance without a rider, but when the rider adds their weight, already sitting further towards the front-end than the haunches, the forehand becomes overloaded, and the horse, out of balance, 'runs downhill'. 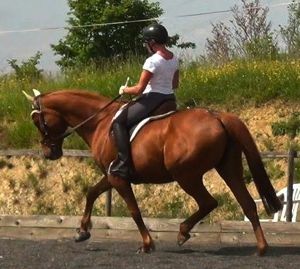 Leaning forwards brings the rider's center of gravity towards the horse's forehand, aggravating the situation. As already stated above, when the rider lets their pelvis drop onto the pubic bone, or 'fork' (right) the seat is not only prevented from harmonizing with the horse's movement, because it blocks against it, but it also has zero re-balancing power in this position. This is because re-balancing a horse with the seat comes from the leverage we create by raising the front of the pelvis into suspension off the saddle by way of engaged core muscles. When the pelvis is passively dropped into the fork seat, it has no leverage with which to draw the horse's hindlegs underneath its body, and instead it follows into the backwards thrust of the hindlegs, supporting the disengagement of the haunches, as opposed to their engagement. Some riding instructors actively teach this kind of seat, sometimes referred to as the three-point seat, because it is a convenient and effort-free way of finding a certain stability while sitting on a horse. The backward-pointing seatbones also block the horse's movement to some extent, making it easier to handle. 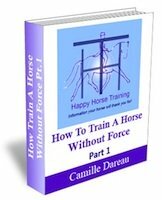 However, as a way of truly becoming part of the horse's movement, and being able to improve its power and purity, it is certainly no solution. When sitting on a horse, it's common for the rider's center of gravity to rise towards the upper body, lifting the weight up out of seat, and away from the horse's own center of gravity. This is often the result of tension in the rider, as when we do not feel balanced and in control on top of the horse, there is an instinctive desire to lift up away from the movement. The shoulders become tense, and the seat is less connected to the movements of the horse's back. This is a viscous circle, of course, because the further the rider's centre of gravity is from the horse's, the less secure the the rider is, and the more the horse will also feel tense and anxious. All of these errors in the technique of sitting on a horse result in a lack of unity between horse and rider, and make the rider feel they need to hold onto the horse's mouth in order to control the situation, and keep some of balance. This holding is counter-productive, however, because it blocks the energy of the horse's movement and creates tension in the horse, both of which prevent a true gymnastic connection of the rider with the horse. The No.1 most important thing you can do to start becoming part the horse's movement is to get your pelvis in the right orientation in the saddle. This means rolling the seat under into a tucked position, so that your weight is on the back of your seat-bones, and the front of your pelvis is lifted well up off the saddle by your engaged abdominal muscles. Your lower back should be stretched and supple. This position may feel unstable or unbalanced at first, because it takes strength in the core muscles to support it, which is something a rider needs to develop over time by consistently making the effort to sit in this way. It is only in this position that the pelvis can follow the cycle of the horse's stride without opposing it, and eventually create the leverage which brings about true collection and re-balancing of the horse. When you first start to ride with a tucked pelvis, because your core muscles will most likely not have the strength and coordination to support it, it is important to keep the upper body well back, in order to help keep the weight on the back of the seat-bones. This is especially important if you have a if you have a naturally hollow back. 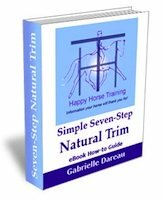 In sitting trot, if you gradually lean back, you will feel at a certain point your seat adheres to movement right through the stride, and there is no bouncing on and off the saddle. This is the place where you need to stay in order to develop the correct seat. As your core muscles get stronger, you will be able to come gradually more upright without losing the tuck of your pelvis. The hips joints are probably the most crucial joints in the rider's whole body, because they act like a hinge between the seat/upper body and the legs. To create a balanced position on the horse - one that is independent of the reins - the rider must stretch this 'hinge' open to its fullest extent, so that the leg can remain anchored underneath the rider's body, which equally stays back in position. 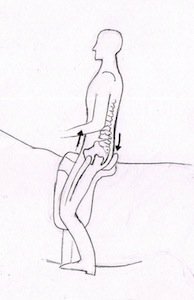 The problem, when it comes to sitting on a horse, is that our hips are very often not supple enough to allow this stretch to happen - our lifestyle is largely responsible for this, as we spend a lot of the time sitting with the hip joints in a closed position, as well as the immobility leading to stiffness. Some of us have more stiffness in the hips joints than others, but all riders need to develop the stretch in this joint. What happens when we ride without supple, stretched hips, is that when we try to bring our legs backinto a balanced and effective position underneath the seat, the upper body is pulled forwards, leading to the problems of leaning forwards described above. In the same way, when a rider tries to bring the upper body back without being able stretch the hips, the leg is pulled forwards into the 'chair seat'. 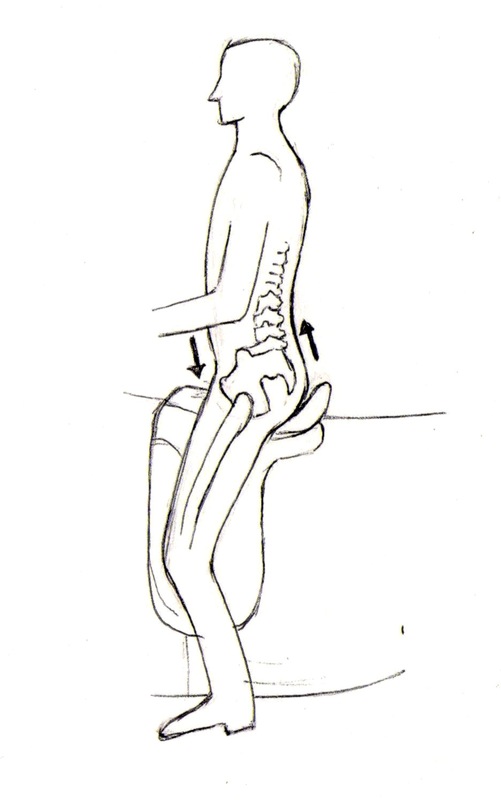 Tucking the pelvis, as described above, puts even more demand on the hip joint, and it therefore takes a long and determined effort for the rider to achieve both the correct seat and leg position. Although this is not commonly seen, it is not an impossibility, as is sometimes stated. Any rider can achieve supple hips if they know how to go about it, and put in the effort required. The rider must always be seeking to drop their centre of gravity towards that of the horse, so that a unification of the two body masses can be achieved. Only when the rider can become fully joined to the horse's movement, can they start to transform it in a profound way in order to bring it into balance. 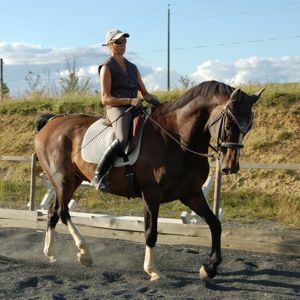 There is a misconception, fairly common in dressage teaching, that the rider should try to remain light in the saddle in order to help the horse lift its back without overburdening it. This is a misunderstanding because the horse is far more comfortable with a rider who has become fully part of the movement, than carrying one who is attempting to hover above it. There is no way the rider can physically become lighter when sitting on a horse, but by harmonizing with the movement and creating one unified mass, the negative effect of the rider's weight is removed. 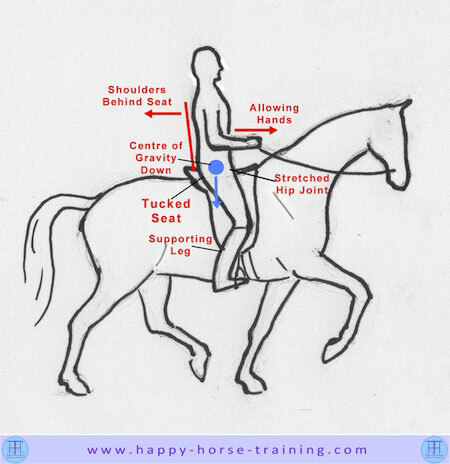 To do this, the rider must drop their weight completely down into the back of the seat by keeping their neck, shoulders and lower back relaxed to prevent the center of gravity rising. The fact that the front of the pelvis is suspended by the engaged core muscles, combined with the stretch of the hips keeping the legs supporting underneath the seat, means that the weight dropped into the seat is not a 'dead weight', but instead a kind of adhesive glue that keeps the dynamic, interactive seat fully connected with the horse. Both horses and humans all have a natural unevenness, which means that when sitting on a horse we almost always get pushed slightly more to one side or the other. In fact, it is usually the saddle that gets pushed over in relation to the horse's spine, and we may sit more over to the other side of the saddle in order to compensate. the crookedness of the horse: all horses have one side which is naturally convex, and the other which is concave (hollow). The rider tends to get pushed over to the concave side. the crookedness of the rider: we all have one side of our body which is stronger for stretching down, and this opposite weak side tends to get pushed over more easily on the horse's back. the bend: when a horse turns, its ribcage tends to push the rider more to the outside. Depending on how these different factors combine, the rider can end up sitting on a horse markedly off-centre in relation to the horse's spine, or less so because the various factors compensate for each other. Either way, it is essential that these unevenesses be addressed so that both horse and rider can become more straight, and gymnastic purity an be achieved. The rider can become aware and monitor the centrality of their seat by frequently checking how well the pommel of the saddle lines up with the horse's spine (withers) underneath it, and also by making sure they are sitting absolutely centrally in the saddle. This needs to be checked both from in front and behind, as there may be a twist in the seat, so you will need someone to tell you whether you are sitting straight on the saddle from the back. Once the rider is familiar with the pattern of their own and the horse's unevenness, postural strength must be used to diligently correct it as much as possible. A final important point is that the rider must never add movement of their own to the horse's movement when sitting on a horse, for example by pushing with the seat or moving from side to side. We can only connect to the horse's movement when we have a 'listening' seat not a doing one. We can modify the movement we receive in the seat with postural resistance, because this does not add movement, it is instead a way of channeling and re-balancing the movement of the horse. When a rider has mastered this way of sitting on a horse, they become fully independent of the reins for balance and security, and the control of the horse is almost fully achieved with the posture, seat, leg and weight aids - the hands taking on an almost fully receptive role. Sitting on a horse in this way is also so much more comfortable and healthy for both horse and rider, because concussive forces are harmonized, channeled and transformed into straightness, power and suspension. 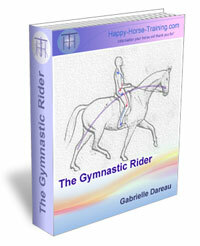 If you would like to know how to apply this way of riding to yourself, The Gymnastic Rider eBook is a comprehensive, practical guide to how to ride in balance, without force and constraint. Click on the link for full details.